Selling a house with foundation issues is a very challenging task. There is no doubt that a foundation problem negatively affects buyer’s decision. The reality is the vast majority of buyers don’t want to see a house if they figure out that a property has any type of foundation problems. However, it doesn’t mean that selling a house with foundation issues is impossible. Keep in mind that somebuyers are ready to purchase a house with foundation problems. Actually, you can sell a house in any condition if you set a correct price for it and follow a correct strategy that works. 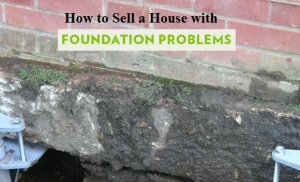 This blog postconcentrates on easy ways to sell a house with foundation problems. We’ll tell you about some of the best options that you have when you need to sell a house with foundation problems. In addition, we’ll give you a few tips to help you sell a home with foundation problems at the highest possible price.Hopefully, you’ll find it easy to make a great a deal after reading our article. Most people think that it’s too expensive to fix foundation issues. Apparently, that’s not the truth!You should know that not all foundation problems are equal. Sometimes, it makes a lot of sense to invest some money and time into foundation repair.It can be enough to make small changes within a short period of time to increase the asking price for your property significantly. Obviously, it’s incredibly important for a seller to have a property assessed by a foundation expert. This type of assessment will cost you $300 – $800.There are different types of foundation problems. These includehairline cracks, L-shape location, masonry join cracks, horizontal cracks and other types offoundation issues. Is a house with foundation issues worth repairing? Actually, this question is faced by so many people who need to sell a property with foundation damage.Depending on the foundation problem and the scope of work repairs may cost you between $5000 and $40000.After having your house assessed by an expert you’ll be able to analyze the situation carefully.Finally, you’ll find it easy to figure outwhether you should fix your house or maybe it’s best tosell your propertywith foundation problems. If you don’t want to spend your time and money on fixing foundation issues then you need to look for a buyer who is ready for repairs. In fact, there are many buyers who are interested in purchasing properties that need repairs. It’s clear that such buyers may agree to buy houses with foundation damage and other types of problems. The big question is – how to sell a house with foundation issues fast?First and foremost, you need to drop the asking price on your home. You should definitelydeduct the foundation repair costs from the asking price. This will help you increase the chance of selling a property with foundation damage. In addition, you need to ask your real estate agent to focus on customers who are interested in buying homes that need repairs. By doing so, you’ll be able to minimize the number of your showings dramatically and save a lot of time.On the other hand, if a real estate agent shows your house to the right type of clients then you’ll probably sell it much faster. Let’s assume thatall of your attempts to sell a house with foundation issues have failed. Obviously, you shouldn’t fall into despair even ifyou don’t have an opportunity to fix your house right now. Don’t panic!You can always sell your house to a real estate investor. The cool about selling a house with foundation damage to a real estate investor is that the vast majority of investors purchase properties in any condition. That means that you’ll be able to sell your home for sure. So, all that you need to do is to relax and take a deep breath! If you go inside the world of real estate investment you’ll quickly realize that a lot of investors are operating in every area.There is no doubt that real investment business is highly competitive.That’s why it will not take you a long time to find a buyer for your property. You are likely to receive a lot of cash offers on your home from investors who operate in your area. And of course, each of real estate investors will do everything he/she can to stand out from the crowd and become a winner. That’s why investors provide buyers with fair all-cash offers.This gives you a good chance to sell your house at a high price. Typically, real estate investors don’t keep their clients waiting for a long time. It will take you about24 – 48 hours to get a cash offer on your property from an investor. Another important thing that you need to be aware of is that investors buy homes fast. So, if you accept a cash offer you’ll be able to sell a house within 7 days. It’s worth noting that typically investors are interested in purchasing different types of properties.Investors purchase homes that need repairs. Many homeowners choose to sell a house to a real estate investor to avoid a foreclosure and its negative consequences. It’s pretty easy to find an investor who agrees to take over your mortgage payments. Investors buy properties from couples who are dealing with a divorce. Investors purchase homes after water damage as well as homes with foundation issues.All of this means that you’ll not find it hard to sell your property to a real estate investor. “For a confidential cash offer on your San Antonio area home, contact us today by calling (210) 693-1533 or filling out the form on this page.